Neutral Bars are UL Recognized and CSA Certified. Using screwdriver or allen wrench for installation, Neutral Bar Series includes Type NBCE Neutral Bar Copper Extended, Type NBAE Aluminum Extended, and Type NBAS Aluminum Single models. Aluminum bars are made from 6061-T6 aluminum alloy and are dual rated for use with copper and aluminum conductor, while copper bars are for use on copper wire only. To provide low contact resistance and protection against corrosion, neutral bars are electro-tin plated. CINCINNATI, OH – ILSCO celebrates 120 years of service to the industry in 2014 and continues to strive to meet the needs of our customers. With this in mind, ILSCO has expanded our offering to include Neutral Bar Copper Extended (Type NBCE), Aluminum Extended (Type NBAE) as well as Aluminum Single (Type NBAS). ILSCO’s neutral bars are UL Recognized and CSA Certified. The aluminum bars are made from 6061-T6 aluminum alloy and are dual rated for use with copper and aluminum conductor. The copper bars are for use on copper wire only. 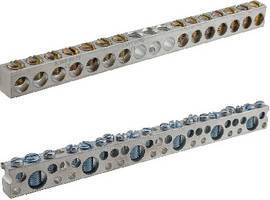 The neutral bars are electro-tin plated to provide low contact resistance and protection against corrosion. A screwdriver or allen wrench is all that is required for installation.